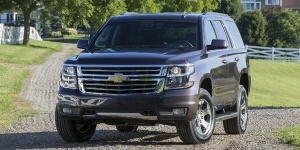 Powered by a strong V8 engine, the Chevrolet Tahoe seats up to nine and tows up to 8,600 pounds. Four-wheel-drive is an option. For 2016, the Chevy Tahoe comes with an 8 in. Color Touch screen radio with OnStar 4G LTE Wi-Fi and Chevrolet MyLink with phone integration technology. The Tahoe LS is now available with an Enhanced Driver Alert Package and the LTZ with a head-up display.